a documentary film project. an experiment in love. Nashville is my current city, and northeastern KY is my hometown. Therefore, no extra funds are necessary to cover those interviews. Destinations closest to me will take top priority, so we can make the most out of the time and money we have. So why did we only set a $400 goal? Because that’s how much it will cost to travel to the closest town (Atlanta) for our first group of interviewees. If we don’t meet our goal, we don’t get any of the money. But with KickStarter, there’s no limit to how much we can surpass our goal! Therefore, the more money raised, the more towns we will be able to add to the itinerary. So you see… $400 is a great first goal—but it’s not our only goal. 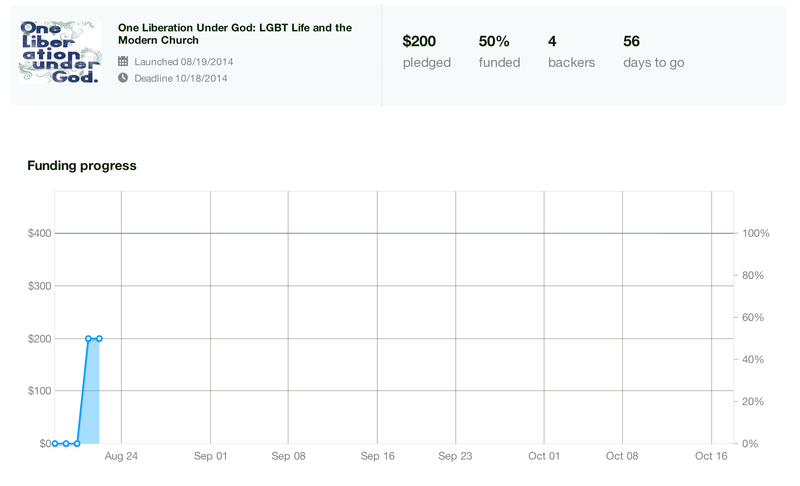 The further we surpass $400, the more stories we will be able to tell. Sure, even if we only get to film in Nashville, northeastern Kentucky, and Atlanta, we will still have wonderful content that I will be proud to present. But how much more amazing will it be to hear countless voices from all over the United States? This is a project I truly believe in. And thanks to you guys, I am now hopeful of its success. Please, please, please share this project with as many people as you can, and as often as you like. We are making great progress, but we need to maintain this momentum. If you have questions about anything, please don’t hesitate to get it touch with me. Thank you guys so much! I’m looking forward to the possibilities. Until then, have a wonderful weekend! Categories: Christianity, LGBT, Religion, Theology | Tags: lgbt, lgbtchristian, religion, spirituality | Permalink. Journalist. Blogger. Dreamer. Theology Nerd. There is a chasm between the Church and the LGBT community, which primarily stems from ill-education and a lack of understanding about exactly what it means to be gay. I'm a very small part of a giant movement that is trying to bridge that gap. I'm not here to change people's minds. I'm just here to advocate loving and life-giving conversation on a topic that is too often silenced. As someone on both sides of the issue, I can accurately say, love is the answer. And we can learn how to love each other without having to agree on everything. Do you believe in this project? Donate to the travel fund!